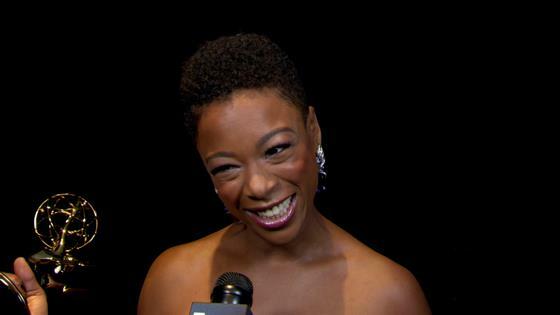 Samira Wiley just wanted a paycheck. Now? She has an Emmy. The Handmaid's Tale star was nominated for her second Emmy—and won—at the 2018 Creative Arts Emmys for her role as Moira on the Hulu drama. She won the Emmy for the Outstanding Guest Actress in a Drama Series category. She was previously nominated in season one in the Supporting Actress in a Drama Series category. "I'm so amazed, I'm so happy, I'm so in awe, I'm so grateful. Everything you're supposed to be, I am," Wiley told E! news with a laugh after winning her trophy. Wiley shot to fame playing Poussey Washington on Orange Is the New Black. She left the show in its fourth season, but it wasn't to go do The Handmaid's Tale, a popular misconception, she said. "There was a time there where I just didn't have a job," she said. "I was shocked when I was going to be on [OITNB] anymore and I was so humbled to be in a place where 95 percent actors are all the time: looking for work, trying to figure out how to do this. And when I got the role, I was just like, ‘I'm gonna get a paycheck again.' That's what I was thinking about at the time. [Laughs.]" Season two of The Handmaid's Tale featured Wiley's Moira living in Canada, a refugee of Gilead. There, she reunited with June's (Elisabeth Moss) husband Luke (O-T Fagbenle) and the two began working on how to create change from abroad. The season ended with Moss' character sending her daughter to Canada with Emily (Alexis Bledel) and deciding to stay behind in Gilead to save her other daughter. Wiley said she doesn't know what's up just yet, but in season three she wants to see Moira and June "just mess some stuff up." "It's time for the world to be turned upside in season three, I think," she said. The Creative Arts Emmys air Saturday, Sept. 15 on FXX.